Here are some wilderness survival tips that I have learned over the years. Waterproof Match Containers – if you break wooden strike anywhere matches in half you can store twice as many in your container. If you have to fish in an emergency, Tampons wrapper make good fishing bobbers. Open the wrapper at one end, take the tampon out, then tie the wrapper closed trapping a bubble of air inside. If it doesn’t float, stuff some of the cotton into the bubble. 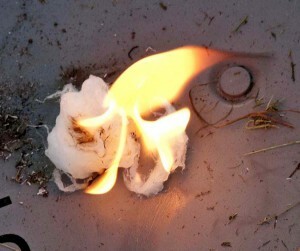 Cotton balls impregnated with Vaseline make good fire starters. I store them in 35 mm film cans and carry one with me when in the backcountry. Homemade Fire Starters are Easy to Make. 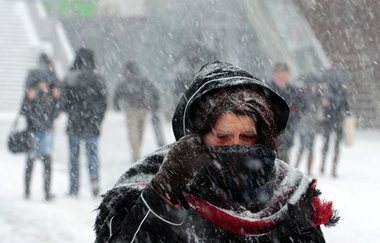 A friend of mine from Finland says that if you are going outside in very cold weather below zero , smear Vaseline or grease on your face, it will help protect you from the cold. All fur-bearing mammals are safe to eat, but some taste better than others. All freshwater fish in North America are edible. All birds are edible. Some just don’t taste very good. Ants, grubs, and grasshoppers can be eaten. A good way to get over your natural resistance to eating bugs is to toss them into a stew with other ingredients. Water that is brought to a boil is safe to drink. The length of time that it is boiled doesn’t matter. If you are going out in cold weather, don’t wear cotton. The old saying is “cotton kills”, wear clothes that retain their warmth even when wet. Stay hydrated, becoming dehydration will cause you to have poor judgment, loss of energy, and eventually you will lose the will to survive and you will die. If it is raining and you need dry wood to start a fire, look for squaw wood. These are the small dead branches that are still attached to the tree. They are up off the ground and dry out first. Look for the ones on the dry side of the tree. Butane lighters are great for starting fires. Carry orange or red ones, they are easier to find if you drop one. Avoid white (snow) and green, they can be hard to find. If possible always go prepared, carry a knife, life straw or equivalent, some food and at least a space blanket. Dress appropriately for the weather. Extra clothes never hurt. Even if you are not trained in wilderness survival, stay calm, find shelter and take the time to think things out. You will find you will remember some of these wilderness survival tips and find you have more knowledge than you think you do. This entry was posted in survival and tagged Wilderness Survival Tips. Bookmark the permalink. Good tips, also , if your clothes are not warm enough for the weather, newspaper , layered under the outer layer helps.